This program encourages anti litter! You choose an area, park, street that you'd like to keep clean. Or you may beautify it after submitting plans and receiving approval. You register with us and a sign will be posted there that you are maintaining it. We would appreciate you letting us know the number of bags of trash you collect and how you improve the area. 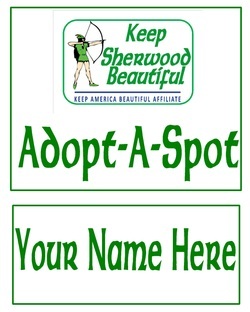 This is for our reporting all the good we do as a community to Keep America Beautiful!! Some of the adopted areas: Jacksonville-Cato Road, South end of Brockington, Austin Lakes Park, Highway 107 and Kellogg, East Maryland, Bayou Bridge to Hatcher, Delmont Park, Verona Park, North Hills Blvd (Country Club to Red River), Lantrip, Woodruff Road (Overcup to Raywood), Wildwood/Country Club, West Maryland, Bear Paw Drive, Fairway Park, Barnhardt Park, Shelby Road, Stonehill Park.